I'm sure you will agree, the online quilting community has provided us all with a limitless source of inspiration, support and encouragement. Julie from julielou and I decided that we needed a regular mid-week link up to share WiPS, starts and finishes. And to keep the love of blogging alive. So we have created Sew, Stitch, Snap, SHARE - it doesn't matter if it's sewing or stitching, snap a photo or three, and share it to our link which we will co-host each fortnight. First up, what's happening here in my sewing room? Well, as some of you know, I am between homes at present, so I've set up a small area to sew and am mainly doing hand sewing- like stitching down my Dresden Plates onto backgrounds for the barij & southerncharmquilts "wild bloom" quiltalong. There's seven of them all together, 3 complete full plates, 2 1/2 plates, 1 wonky one, and 1 1/4 plate. Time consuming, but so ridiculously cute. And I'm loving adding little extra embroidery bits to make my quilt have more of a bohemian look about it, learning heaps! - this little one ends up at 7 1/2" across, other larger ones are 9"
but here's a little peek at how things are looking so far . . .
1. Link up any post from the past week that features a sewing or stitching project you have been working on, whether they are WiPs, starts or finishes. You can write as much or as little about your project as you like, and snap off a pic or three, and share here. 2. Somewhere in your post, please link back to this one. 3. Also please take the time to read and comment on some of the other linked posts. ohmygosh. Everyday in blogland I see something that blows my mind and opens more creative possibilities. 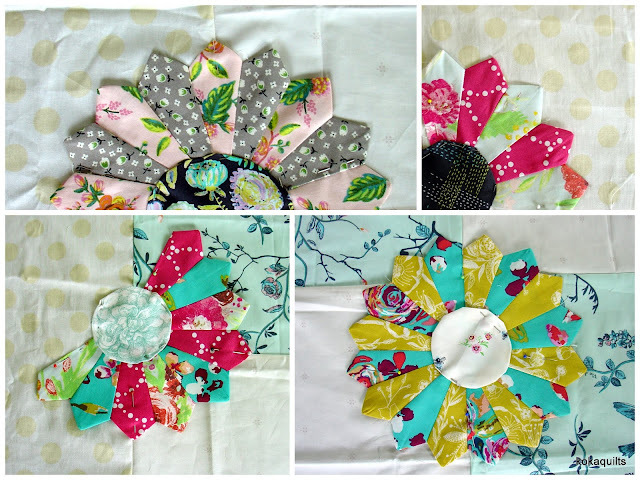 Thank you for sharing your southarncharm quilts progress and link it is so lovely. Your photos are amazing! Dresdens are such fun blocks. Love those little embellishments, did your mum crochet them? I think this quilt is going to be rather stunning when it is all completed. Enjoyed reading your blog your projects are wonderful. Would love to join in the fun but at the moment we are doing a fare bit of stop start traveling. Not a lot of sewing is being done over the next month. Keep up the great work. Linda this really is coming together beautifully and to have some treasures of your mothers will make this all the more special. It's always good to see the individual bits of this quilt, but I hadn't really thought properly about how they would all look together - and they look fantastic! Those little bits of tatting are going to be a sweet addition! Ah, I knew someone out there would know what they actually were! Tatting... must explore this a bit more. 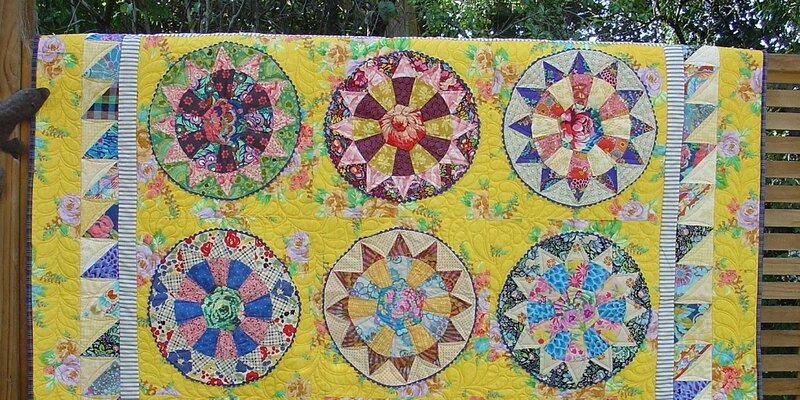 Your Boho quilt is looking fantastic. How nice that you can add your mom's tatted bits. I have some of my husband's grandmother's tatting and I hesitate to use it for some reason. Using it is better than keeping it hidden in a tin or basket. Her tatting and a shuttle that was passed on to me that was hers inspired me to give tatting a try a few years ago. I like the way your plates are growing and coming together so well. And that you are still managing to squeeze in sewing time. Thanks Karen. Yes, I’m doing a little sewing now & then, but I must admit my heart isn’t in it just at the moment. Waiting (very) patiently for the 9th March, that’s when we move into our new home. Very exciting to be moving after 45yrs!! I really enjoy your two blogs. Showing regularly what you are doing day by day and the growing of a project. Sigh, I want to be regular but am just too bogged down in work at the moment. These are so beautiful! I love the Dresdens, and the little sweets tin is a special treasure for sure. Your blocks are lovely, good progress. I agree, the tatted flowers are sweet and will be a perfect addition. Your blocks are amazing all together! This is such a playful QAL. 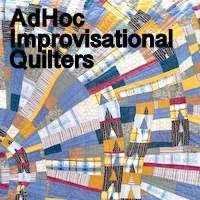 Each quilt looks so unique!